Influencer marketing—who hasn’t heard of it? More buzz-worthy than a hive of bees, this valuable strategy is quickly becoming (and, in some cases, already is) the focus of many brands looking to optimize the social space. Defined as “the strategy of establishing relationships with influential people who can amplify and expand visibility for your brand’s products and services,” influencer marketing is all about connecting with the right folks in order to get your message out there, authentically. When executed correctly, influencer marketing has the ability to reach niche audiences and create a greater impact than traditional advertising methods. In fact, a Nielsen report that shows 84% of worldwide consumers will take action based on the reviews and recommendations of trusted sources above all other forms of advertising. When executed incorrectly, however, certain mistakes can prevent your company from maximizing the potential of this strategy. 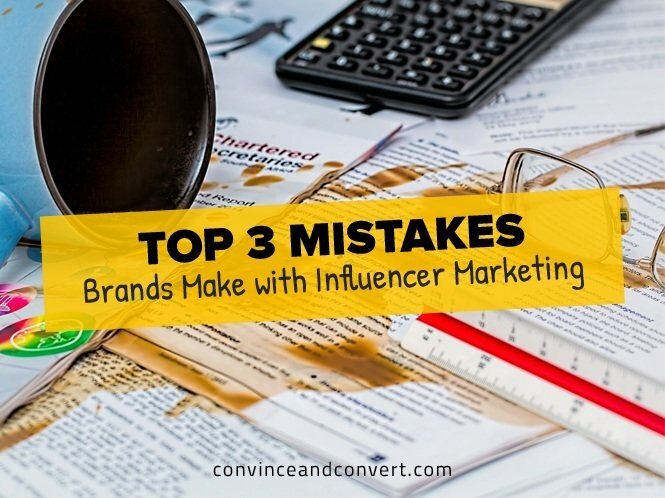 Here are a few of the most common mistakes brands are making when it comes to influencer marketing. Picking the right influencer to work with your brand is about more than just the number of followers they have. It’s about common interests, demographics, market segments, and more abstract variables such as attitudes, self-image and expertise in a particular field. This can be a very manual process. First, you have to define the boundaries of who you want to identify as an influencer. For example, are you a kids toy brand in Atlanta that wants to target mommy bloggers living only in the state? Are you a B2B brand focused on marketers that work in technology? Identifying the “who” is the first step, and once you do that, the next step is finding those that have the most influence. What they talk about, their Klout score, community, followers, engagement, and endless other identifiers come into play here. If the manual process seems overwhelming, you might consider automating the process with a social intelligence platform like Insightpool. One of the main functions of this marketing platform is predicting the right people to connect with. It uses 65 dimensions of compatibility and analyzes 400 million people across thousands of variables in order to discover those that will advocate and promote your business. If it sounds easier than scouring Twitter profiles, that’s because it is! The software does the work while you watch referrals, sales, and engagement increase. Keep it real—and keep the conversation moving! Communication and authenticity play a huge role in influencer marketing, just as they do in any relationship. In fact, the greatest 1:1 relationships happen when the brand thinks about building real connections with real people. Personalize the message. Say their name in the message to make them feel that the communication is directed at them. Add a personal ending to a tweet. 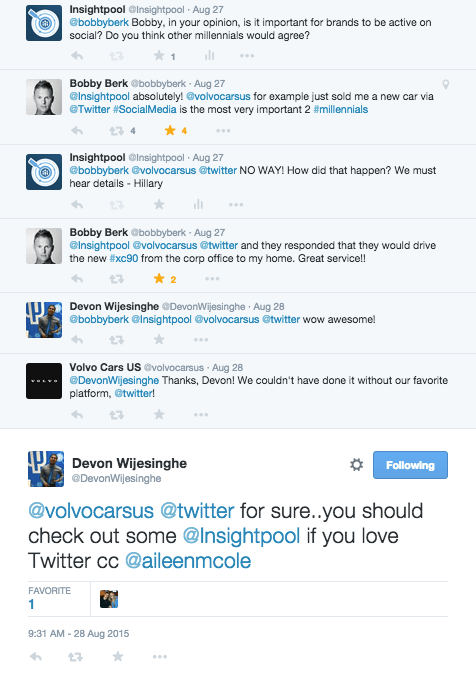 Our team has rockstar marketing members that run the handle. When they start engaging in the conversation, they sign their name at the end so those engaged know there is an individual on the other end. Boost their ego. Everyone likes a compliment, so highlight what they are best at. A simple, “Hey Hillary, I know you are an expert in content marketing, share with us some tips!” is sometimes all it takes. Generally speaking, being disorganized makes everything more difficult—especially when it comes to your game plan. It’s best to outline every aspect of your campaign, create an editorial calendar, and identify the end goal. “As someone who has worked with many brands as an influencer, organization makes all the difference for how I participate during a campaign and how I perceive the brand afterward,” Michaelian says. Being disorganized when it comes to tracking and analyzing the outcome is also a no-no. You wouldn’t follow up a traditional campaign without a review of the numbers, would you? Be sure to analyze all the metrics, which according to Enterprise Innovation should include “tracking the total shares on the various social media platforms, social sentiments, and engagements in terms of comments and clicks.” This can help you determine what worked, what didn’t, and where to invest your marketing budget in the future. Identify. Predict. Nurture. Measure. That’s the Insightpool strategy—simply designed to help keep your brand on track. Even if you don’t use our platform, it’s still a useful starting point for developing an organized approach. As mentioned above, identifying your target audience is the first step. The next step is predicting the users that will take desired action—whether that action is a simple retweet or a promise to stop by a store location. The third step is about nurturing those connections you’ve made in order to create lasting relationships. Measuring results and tracking insights is the last key step. Following up with these metrics at the influencer level is important, as it allows you to optimize your approach and evaluate your relationships accordingly. In the end, no brand is perfect, but knowing the common pitfalls of influencer marketing and how to counteract them can save time and money. From engaging with the right influencers to tracking your results, your brand can reap the benefits of this buzzed-about strategy.